Run by volunteers from the Greek Orthodox community of Oregon, the Camp Angelos Conference & Retreat Center is located only 24 miles east of downtown Portland in the foothills of Mt. Hood. It's an exceptional site with first-rate accommodations. Intimate gathering places from the lodge patio to porches to wooded groves to a sandy beach abound on these 98 forested acres nestled alongside the scenic Sandy River. 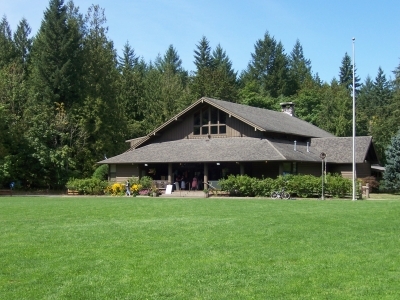 The facilities at Camp Angelos are modern, attractive and convenient. The Kalamata Lodge has spectacular woodwork, an open-beamed ceiling and a massive stone fireplace. You're never far from a restroom, and the whole camp is ADA-accessible. Camp Angelos has two cozy clusters of several 12-person cabins, each with light and heat. Large bath facilities are close by with lots of showers and abundant hot water. Campers needing privacy might prefer to tent or bring RVs - there's lots of room for both. Children and adults alike will be drawn to the soccer field, volleyball area, and outdoor basketball court by the Lodge. The relaxed schedule of this camp gives us ample opportunity to play together - one of the great features of balkanalia!